Toxicologists based at the University of Utah have completed laboratory studies of autopsy specimens from the body of Elvis Presley and have found that 11 drugs were present in the singer's system at the time of his death, The Tribune has learned. All of those drugs were consistent with medical treatment, said the director of the Center for Human Toxicology, Dr. Bryan S. Finkle. He spoke to The Tribune in an exclusive interview. The Center had been called in to provide a third toxicological analysis of typical autopsy specimens from Presley's body. He reported, "We have not detected any drug in Elvis that doesn't have a medical rationale to it - only agents prescribed for perfectly normal, rational medical reasons." Dr. Finkle said the singer had not been drinking prior to his sudden death, which reportedly was blamed on an erratic heartbeat, last Aug. 16. Efforts by the Tribune to obtain a copy of the report by the Center for Human Toxicology have not been successful. The Center received the first of the autopsy specimens on Oct. 4, and when The Tribune learned of this Dr. Finkle postponed requested interviews for professional reasons as he was acting in a consultant's role and in that, cannot talk in specifics. He spoke, when interviewed, in general that, yes, he had been involved in the case and that he found 11 drugs, all consistent with medical treatment. Of course, that the entertainer did have prescription drugs in Elvis Presley´s system at the time of death has previously been reported. Most accounts mentioned from eight to 10 drugs. The Center for Human Toxicology, which has an international reputation among toxicologists and forensic scientists, was the third organization called in in this phase of the Presley autopsy. The others were the Baptist Memorial Hospital in Memphis, Tenn.,and Bio-Science Laboratories, Van Nuys, Calif. Bio-Science requested the Center of Human Toxicology conduct the third examination, said Dr. Finkle. While certain agencies, including the center based at the University of Utah, and the Shelby County, Tennessee, Medical Examiner's Office, involved in this story receive public monies, it appears unlikely that there will be disclosure of specifics about the toxicological analysis. The autopsy performed was done at the request of the Presley family. In a nutshell, rights of privacy prevail and the parties appear to have no legal duty and are not compelled to disclose certain documents, in particular the toxicological report of the Center for Human Toxicology. Dr. Finkle, as a consultant in the Elvis Presley case, said he wrote a two-page report based on his findings at the request of Bio-Science. In it he lists the found drugs, their concentrations and he concludes with an opinion as to the potential or possible toxicological consequences of having this number of drugs in these concentrations in a body. 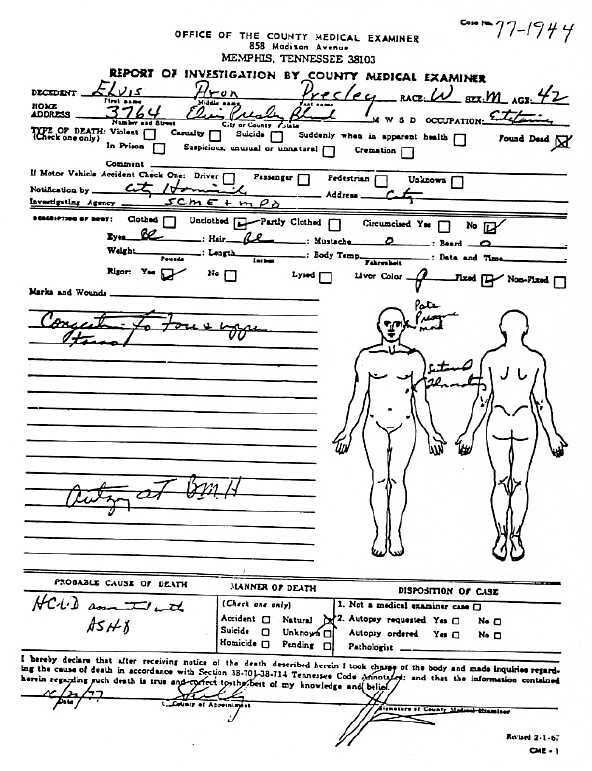 The laboratory results here apparently satisfied Shelby County Medical Examiner Dr. Jerry T. Francisco that Elvis Presley's death could not be attributed to drug overdose. However , it was learned that the death certificate was signed before the final Finkle report was mailed. Dr. Finkle's opinion was solicited earlier by a phone call, and Dr. Francisco later said publicly that the prescriptions drugs found in the singer's system were not a contributing factor. The Associated Press, reporting on a press conference Dr. Francisco called last Oct. 21, quoted the medical examiner as saying that four drugs were found in significant quantities in the entertainer's bloodstream. They are Ethinamate, Methaqualone, codeine and barbiturates. The first two are sedatives; codeine is a narcotic analgesic or milder, secondary pain killer, and barbiturates are "downers" or sedatives or depressants. Dr. Francisco was quoted as saying that four other drugs-the antihistamine chlorpheniramine, meperidine, morphine and Valium-were found in what were said to be insignificant amounts. Meperidine and morphine are pain killers and Valium is a tranquilizer. Presley was not taking morphine ; the morphine was a byproduct of the codeine. The AP said Dr. Francisco said the amount of drugs found in Presley's body, collectively, would not have constituted a drug overdose. And he said it was unlikely that the drugs' chemical reactions within the body could have contributed to his death. He said Elvis Presley died of a heart disease. "Had these drugs not been there, he still would have died." Dr. Francisco was quoted as saying that the press conference. But at this time the Finkle report was not in hand. It was not completed until December. 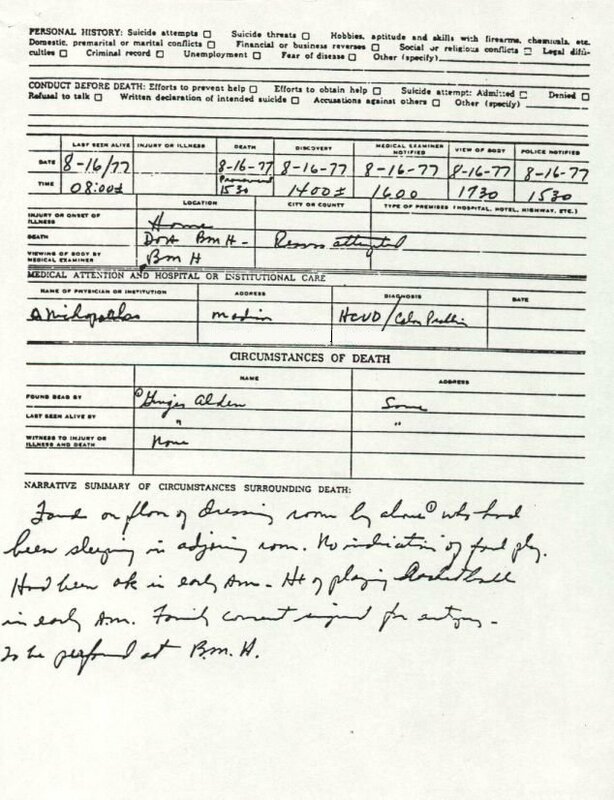 Nonetheless, the death certificate was signed at a point-just prior to the release of the Finkle report-where tests were sufficiently completed so that authorities could conclude that the drugs did not contribute to the death. Officially, Dr. Francisco said in Memphis in October that Elvis Presley's death was caused by hypertensive heart disease with coronary artery disease as a contributing factor. The autopsy was conducted by Dr. Eric Muirhead, chief of pathology at Baptist Memorial Hospital. The autopsy was reportedly most thorough. While Dr. Finkle would not be specific, he did give some solid information. He said that he found no Ritalin in the specimens. Ritalin is a stimulant and a trade name for preparations of methylphenidate. Dr. Finkle said he had been specifically asked to look for this drug among other agents. As a toxicologist and not a medical doctor, Dr. Finkle will not even remotely discuss or determine cause of death. If he has an opinion he is keeping it to himself. The 42-year-old- Elvis Presley was found face down on the floor of a bathroom at Graceland, his 18-room mansion, at 2:30 p.m. Aug. 16. He had been last seen alive that day about 6 a.m. after playing racquet ball with members of his entourage. He was a sick man. He had hypertension and a colon problem. Efforts to revive the singer were abandoned that day at 3:30 p.m. at Baptist Memorial Hospital. The autopsy was reportedly very thorough and careful with several doctors participating. Dr. Finkle explained that it is routine in any medical-legal investigation for there to be three facets to a scene investigation of what were the circumstances surrounding the death; the medical-legal autopsy, and support investigation in clinical or toxicological laboratories. And, the Elvis Presley case was reportedly conducted along routine lines. When taken to the hospital, there was reportedly suspicion that Presley died of what might loosely be called a heart attack; there were signs of cardiac arrest and cardiovascular blood flow problems. Autopsy specimens were routinely sent to the laboratory, and it was decided to have two toxicology labs do the work-the hospital's and Bio-Science. Dr. Finkle said, "as far as I know" there was no conflict between the two toxicologists, but there was some medical opinion differences as to what quantitative amounts of the drugs might mean relative to Elvis Presley's death. The physician who conducted the autopsy, Dr. Muirhead, did not respond to a telephone call and letters from The Tribune. Shelby County Medical Examiner Dr. Francisco responded that the autopsy was done at the family request and with family authorization by the pathology staff of Baptist Memorial Hospital. This separated him for authorized toxicology studied and he is unauthorized to release any reports, he said. 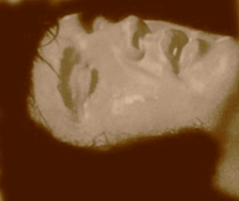 "What he have done," said Dr. Finkle, "is to conduct a routine, complete series of forensic toxicological analyses on specimens and determine quantitatively what drugs were present in the victim and in what breakdown and we were asked what this means: is it germane to Elvis death, did he die of drugs or didn't he?" said Dr. Finkle. Elvis Presley's illnesses included hypertension, some cardiovascular compromise and a colon obstruction. He fought a losing battle with a weight problem for several years.